Years ago, when YouTube was a newcomer to the world of online video hosting, other websites sprung up to serve the same purpose. Most of them have either declined into small niche video hosts or folded entirely when the cost of infrastructure outstripped the possibility of monetization. Only YouTube has made it to the big time, at least in the safe for work markets. One of the few competitors that still exists and is reasonably popular is Vimeo. Vimeo actually launched in 2004, a year before YouTube. It has gone through a series of ups and downs, ranging from their focus on indie filmmakers to their ban of gaming videos that lasted six years. Today, while Vimeo is a solid platform, it plays second fiddle to YouTube simply due to the sheer size and scale of the latter platform. They monetize through disk space allotments and premium packages, something YouTube hasn’t needed to do. 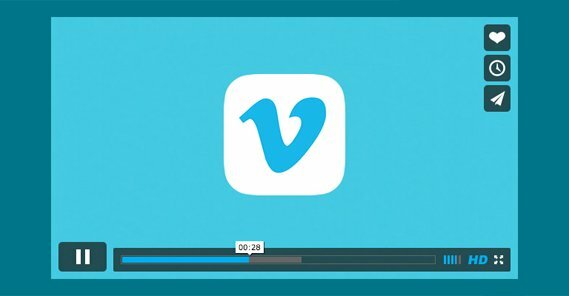 Even so, Vimeo is a good platform for hosting videos, you just need to know how to use it to grow. If you want your videos to get more exposure, there are a few ways you can do it. Here are my top five techniques. The first thing you need to do is make sure you’re laying a strong foundation for your video on Vimeo. If you aren’t setting up the groundwork for success, every subsequent effort is going to falter. It’s like having a great promotion strategy on Facebook and Twitter, only to link to a 404 page. It just doesn’t work. So what makes a strong foundation? Consider the technical elements. Your profile should have an avatar and banner photo that match your branding. Header photos are often screens of projects you’ve created, while profile photos are generally logos. You should have a sensible username, and fill out your profile completely. Your header can also be a video, and that works even better if possible. Your video page itself should have a clear title and a well-written description. You get more space for a description than on YouTube, so it’s a good idea to fill it out as much as possible. You should add “credits” for anyone who worked on the video who has a Vimeo account. This allows it to appear in their profiles and allows fans of those individuals to see the video more easily. Your video itself should, of course, be high quality. Vimeo is a platform that focuses heavily on short films rather than marketing videos, but a lot of different kinds of content can thrive there if you find the right audience. Vimeo might have a much smaller audience than YouTube, but they have a much more engaged audience on average, with many users being filmmakers and producers themselves. Nothing here should be new to you, other than the credits system. It’s all elements of any video or social network that allows you to upload video files. Just fill out everything as much as you can. This is all baseline stuff, so make sure you’re doing what you can. Vimeo Groups are an interesting system that sites like YouTube don’t have. Unlike something like playlists, where you add your own videos to a list of more videos you uploaded, Groups are accessible to anyone. 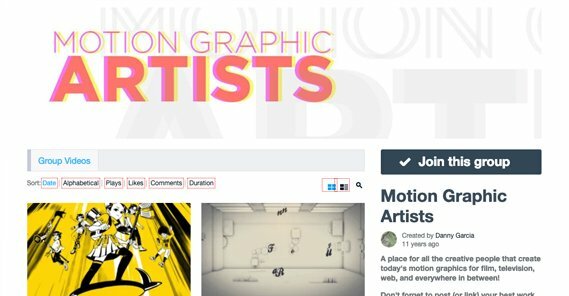 Motion, a group for motion graphic artists. Motion graphics are a specific kind of video that is often used as cuts, interstitials, intros, and stock videos. This group has 30,000 members and is 10 years old. Music Videos, a group for, well, music videos. This is a “closed” group that operates as a companion to a specific channel, which they use to curate videos they like. HDXtreme, a group for extreme sports videos in HD. It’s a great place to see high resolution videos of extreme athletic ability. Video School, a group for tutorials for everything from film lighting to audio editing to production. Now, browsing through those groups, you’ll notice a few things. Some groups are closed, meaning the creators only curate videos themselves, so you won’t be able to access them if you’re not part of the group. Some groups aren’t active, and may not have curated a video in years. Other groups might be more active, but are narrow niches that might not fit your video. You can’t use Vimeo Groups the way you would Facebook Groups, just joining to dump your video and leaving. Vimeo Groups are communities centered around a specific topic. Only join them and add your videos if you’re genuinely going to be part of the community. To be honest, Groups are something of a legacy feature that isn’t really in active use amongst the whole of Vimeo’s audience. If you can find an active group that suits your niche, by all means, join it and make use of the community. If you can’t, don’t sweat it. 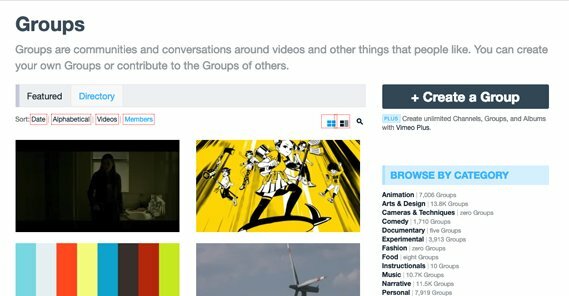 In order to make use of Groups, you need to have a Vimeo account in the group. Browse groups – you can see the group hub here – and join any that look both active and relevant to you. Participate in the group for a while, commenting on and promoting videos from the people within the group, and eventually you’ll be accepted as a member in a social way. When you’re part of a group, you can visit your video page and hover over your video itself. One of the buttons that appears is “add to collection”. Click this and you will see a list of groups you’re in; you can add your video to any group. Just make sure you aren’t going to run afoul of a moderator who doesn’t want random videos added to their group. 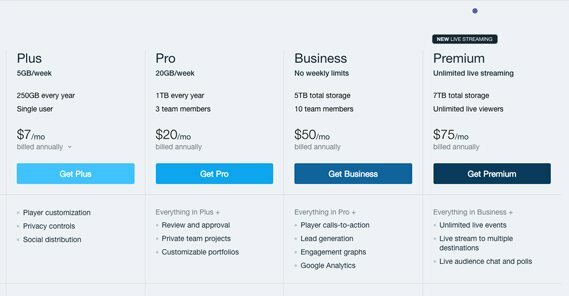 Vimeo as a platform can be free to use, but there are paid plans as well. This is how they stay ad-free for normal viewers. They have four different tiers of paid plan on top of their free plan. The free plan has limited video storage and a lot fewer features than the paid plans. Plus: This plan costs you $7 per month. It gives you the ability to customize the video player, adds privacy controls, and lets you link social networks for automatic distribution. You get unlimited player bandwidth, 4K support, and ad-free videos. You can embed videos anywhere and create custom end screens. You can password-protect your videos and get private link sharing. You get the ability to embed playlists as well. Analytics include a stats dashboard, social stats, and custom reports. Pro: This plan costs you $20 per month. In addition to what the Plus plan gives you, it bumps up your storage limits and gives you team member access. You get the ability to manage team projects. You can add your logo to the video player and get playback speed controls. You can also access video version histories, portfolio mini-sites, and get engagement graphs in your analytics. On top of that, you can sell videos through the site if you want. Business: This plan costs you $50 per month and removes the weekly limit on uploads. You can link Google Analytics to your account, and you get up to 10 team members. You can create end cards and calls to action within your videos and harvest user email addresses directly from your videos, something you can’t do with any iteration of YouTube. It also opens access to the Vimeo API for marketing software integrations. Premium: This plan costs you $75 per month and gives you all of the above, with the addition of livestream functionality. As you can see, there are some very interesting marketing tools, including the ability to generate a mailing list opt-in directly from your video! This is a very cool tool that is unfortunately quite expensive at the $50 per month minimum. It’s very worth considering, but if you’re trying to growth hack your video marketing, it’s probably just too much. One pretty cool feature of Vimeo is that the staff can pick videos that they like and feature them in a custom channel. 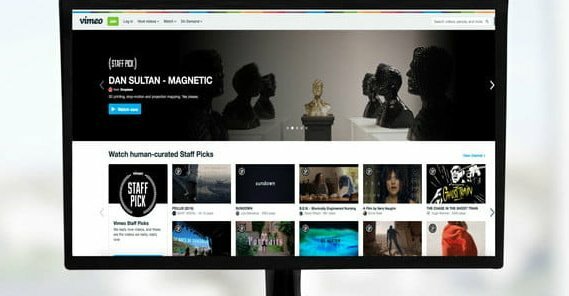 This channel, the Vimeo Staff Picks channel, has a million followers and is active with recently added videos. Staff picks get a number of benefits. First up, all staff picked videos get a special badge that indicates how much attention they’ve gotten. Staff Picks can also be re-featured in best of the month, best of the year, and best of the decade features. These are incredibly evergreen and give you a ton of additional exposure. In some cases, with a deal with a staff member, you can premier a video as a staff pick, but that’s not super likely to happen. So how do you get a staff pick? Well, you need to attract the attention of a staff member and get them to use their pick on you. If that sounds like a tall order, it certainly is. There are a lot of good creators on Vimeo, and not a lot of staff members. In fact, only a handful of staff members post picks, and they claim there’s a system in the back end to help choose those picks. This article analyzed a series of staff picks and came up with averages for what a staff pick looks like. Titles are generally short, between 2-5 words long. Film-like titles are often the most evocative. Thumbnails for your videos aren’t necessarily important; it was an even split between custom thumbnails and video stills. Shorter descriptions seem to be more frequent. Your actual description section can be full of plenty of information, like credits, links, and awards, but the actual description should be more like the elevator pitch or tagline. Picked videos are often produced by credited teams. This is in part simply due to the higher level of quality from team productions, and in part due to the additional exposure you can get from mobilizing team members. Sound is very important; if you use both music and sound effects you’re much more likely to reach a staff pick than using one, the other, or neither. At the end of the day, there’s always one tried-and-true method of marketing, and that’s influencer marketing. You want to get exposure? 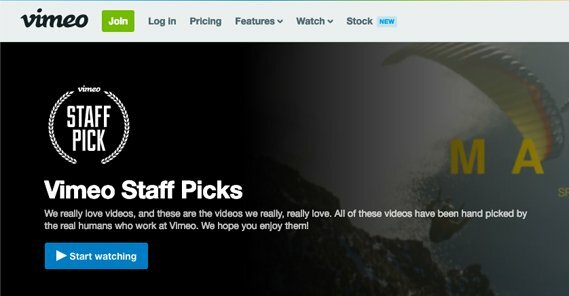 You want something on the level of a staff pick, but without needing to go through the Vimeo staff themselves? Find off-site influencers and send them the link to your video. I’ve seen some great success come from getting a video in the hands of a site like Gizmodo. Simply make a list of good, high quality publications that could be interested in your video, draft up a pitch, and send it off. The worst that can happen is they ignore you, right? On the other hand, one of those “this film from <creator> is blowing my mind” articles can give you the viral surge in popularity you’ve always wanted. Can Buying Traffic or Views Get a YouTube Video Banned?